Here is a very interesting, vibrant and well-made slot game, as Trolls Bridge brings a fantasy team to the trademark strong graphics of Yggdrasil, available here at our online slots casino. With 5 reels and 20 pay lines to work with, Trolls Bridge is very easy to play and flows ever so smoothly, making your journey across the bridge nowhere near as bad as it could be. Plenty of bonus features and a game with a decent sense of humour makes for a very rewarding online video slot game. This game was developed by the very highly respected Yggdrasil, who have a knack for creating online slot games with superb graphics. Often taking on original and ambitious themes, they never fail to impress when it comes to their animations and they are a company who really care about pushing the boundaries of what an online slot game can be. As ever, Yggdrasil brings superb graphics to this title as well as a host of features. For other Yggdrasil titles, check out Nitro Circus or Wolf Hunters. Click to play slot games here! 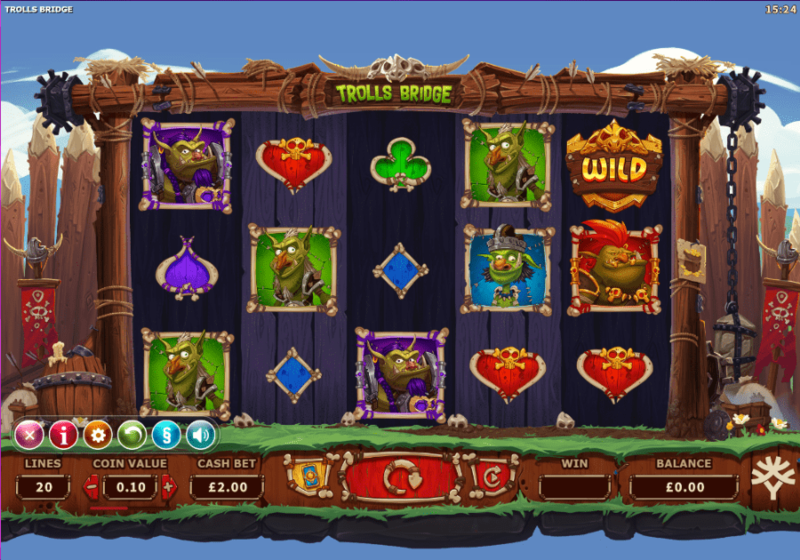 As mentioned, Trolls Bridge has 5 reels and 20 pay lines which is a fairly standard layout for an online slot. However, superb animation, strong graphics and a lively soundtrack make it more than just your average fruit machine. You might like to check some popular online slots through our guide. Fans of slot games with real narratives will be into this, as along with the more standard lower paying symbols of playing cards, you will find funny little-animated troll creatures, each of them unique, popping up from under the bridge and onto your reels. Of the four trolls that you will see, the one with the red hair is the most valuable. Land 5 of these fiery haired trolls all on one pay line, and you will be rewarded with 250 times your original stake. As for other useful symbols, there are 4 kinds of wild; a regular wild, a sticky wild, a random wild and the Troll wild. The latter three of these only appear in bonus features, but the regular wild will appear in the base game. The game has a Golden Bet feature which increase the stakes hugely, and your first choice to make on the bridge is whether or not to activate it. Also, in the base game, hope to land a Bonus Pot symbol as doing so will earn you a prize. These can be in the form of free spins or if you’re really lucky, a number of coins ranging from 40, all the way up to 1000. There are free spins symbols here, too, which do exactly what you would expect, but with the added extra of a card game, too. You will need to land 3 or more of the free spins logos to trigger this feature which is integral to getting the bigger scores in Trolls Bridge. 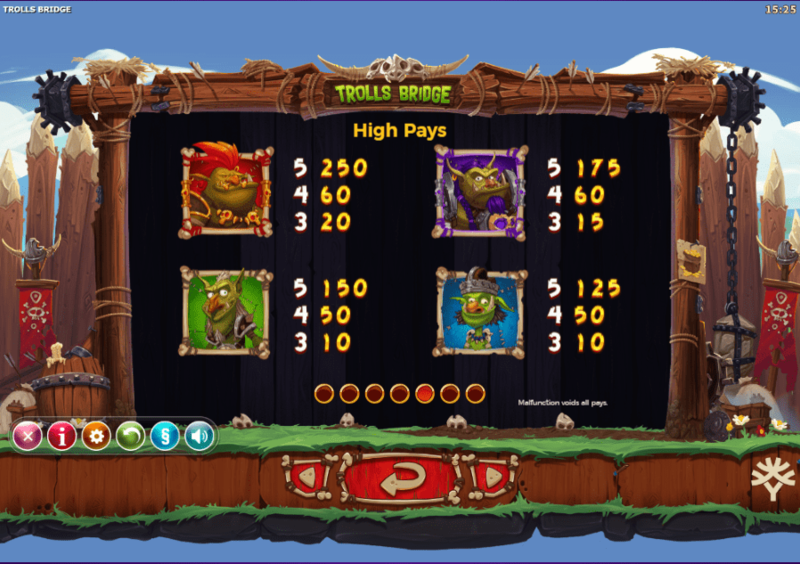 Trolls Bridge is packed with features and this usually makes for an exciting online slot game.